In 1890, Granite, a.k.a. “Montana’s Silver Queen” was a bustling city. More than 3,000 miners, merchants, and families made their home here on remote Granite Mountain, just a few miles southeast of Philipsburg. Like most of the silver ore, most of the stores, saloons, schools, restaurants, and the hospital are long gone from Granite. 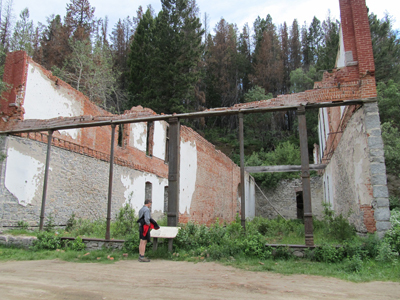 The bones of the Miners Union Hall (photo below), a bank, and a few other buildings still stand, as do remnants of the mines and equipment. 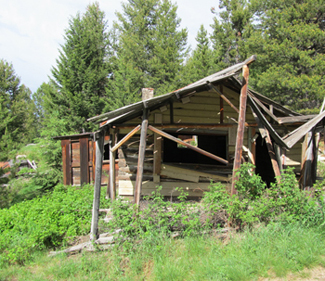 If you’re a history buff, you’ll find it fun and interesting to poke around this dilapidated ghost town. The road to Granite is unpaved, rutted, and steep and narrow in spots, so a four-wheel drive vehicle is recommended. 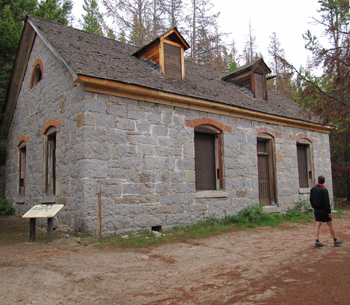 To get a feel for what it would have been like to live and work here, bring your imagination— and your mosquito repellant— as you wander the quiet streets now surrounded by the thick Deerlodge National Forest. Mining began in Granite around 1875, but it wasn’t until five years later when Charles McLure found a piece of dark-colored, high grade “Ruby” silver ore (pyrargyrite) in the tailings that the real activity began. Convinced he had found a source of unsurpassed riches (his silver ore sample was assayed at 2,000 ounces to the ton), McLure traveled to St. Louis in 1880 to find investors. He was successful in raising $130,000 to get mining operations underway, but not so successful when he first returned to Granite. For months, there were no results. It got to the point that the fed-up investors back in St. Louis, unwilling to continue to lose money, sent a cessation order to McLure and his miners. Luckily, that order “crossed in the mail” with McLure’s victorious message to the investors telling of a rich strike! For the next 10 years, the boom was on. 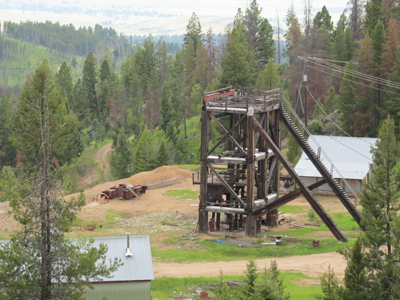 Granite Mountain paid over $100,000 per month in dividends to investors and total production ran to $33 million in silver from the Granite Mountain (photo below, left) and between $11 and $12 million from the nearby Bi-Metallic Mine (photo below, right). By 1889, the Superintendent’s House stood at the head of Magnolia Avenue, or “silk stocking row” where the elite of Granite lived. Superintendent Thomas Weir lived here from 1889 to 1893. A capable manager, Weir did much to improve the living and working conditions of the miners. He built a hospital, had bunkhouses sanitized, gave the men one day off each week, and paid good wages. As with most boom towns, Granite’s days were numbered. In 1904, the price of silver plummeted to 53 cents per ounce when the government reduced the ratio of silver to gold bullion in the treasury. 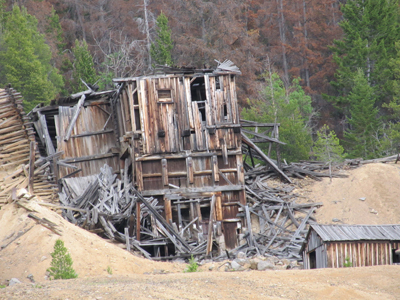 The mines were forced to remained closed until WWI when manganese, previously discarded in tailings, and government price supports made the ore bodies profitable to mine again. The last resident of Granite died in 1969 at the age of 75. Mae Werning’s house is literally falling down now (photo below), but serves as a reminder of the abundant success and wealth Granite enjoyed in its heydey. Driving directions from Philipsburg, Montana: Turn south at the stoplight in downtown Philipsburg. Continue through the railroad underpass and take the first left. Continue straight ahead for 1 mile. Turn right on the road marked with a white sign reading Granite. Keep left and continue 4 miles to the ghost town. No trailers. A four-wheel drive vehicle is recommended.